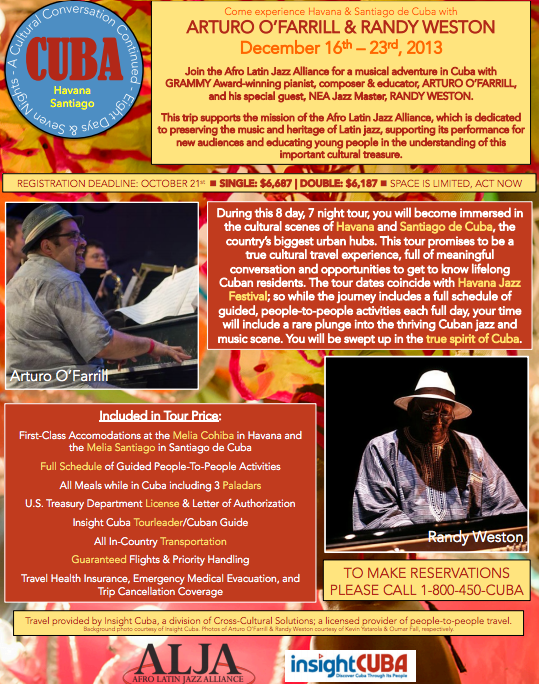 This custom tour supports the mission of the Afro Latin Jazz Alliance, which is dedicated to preserving the music and heritage of Latin jazz, supporting its performance for new audiences and educating young people in the understanding of this important cultural treasure. During this 8 day, 7-night tour, you will become immersed in the cultural scenes of Havana and Santiago de Cuba, the country’s biggest urban hubs. The tour dates coincide with Havana Jazz Festival, which will include a unique plunge into the thriving Cuban jazz and music scene. Expect to be swept up in the true spirit of Cuba! ARTURO O’FARRILL, pianist, composer, educator, and founder of the nonprofit Afro Latin Jazz Alliance, was born in Mexico, grew up in New York, and was educated at the Manhattan School of Music, Brooklyn College Conservatory, and the Aaron Copland School of Music at Queens College. Mr. O’Farrill played piano with the Carla Bley Big Band from 1979 through 1983. He then went on to develop as a solo performer with a wide spectrum of artists including Dizzy Gillespie, Steve Turre, Freddy Cole, The Fort Apache Band, Lester Bowie, Wynton Marsalis, and Harry Belafonte. In 1995 Mr. O’Farrill agreed to direct the band that preserved much of his father’s music, the Chico O’Farrill Afro Cuban Jazz Orchestra, which recently concluded a 15-year residency at Birdland. In 2002, Mr. O’Farrill created the Afro Latin Jazz Orchestra (ALJO) for Jazz at Lincoln Center due to a large body of music in the genre of Latin and Afro Cuban Jazz that deserves to be much more widely appreciated. His debut album with the Orchestra, Una Noche Inolvidable, earned a GRAMMY Award nomination in 2006, and the Orchestra’s second album, Song for Chico, earned a GRAMMY Award for Best Latin Jazz Album in 2009. In 2011 Mr. O’Farrill and the ALJO released their third and newest album, 40 Acres and a Burro, which was nominated for a GRAMMY Award for Best Large Jazz Ensemble Album. Widely regarded as one of the master architects of Afro Cuban Jazz, ARTURO “CHICO” O’FARRILL almost became a lawyer. Born into an Irish-German-Cuban family in the Havana region of Cuba, Chico was slated to follow in the family tradition and enter into law practice. Luckily as a teenager he was sent to study in the United States, where he heard the sounds that would change his life and revolutionize jazz, the trumpet and the big band. After studying at the Havana Conservatory and performing in nightclubs, Chico decided to move to New York where he continued his musical studies with Stefan Wolpe of the Juilliard School and gradually integrated himself into the New York Jazz scene. It was there that Benny Goodman who had trouble pronouncing his name dubbed him Chico and hired him almost immediately as a staff arranger. During his tenure with Goodman, O’Farrill penned one of Benny’s biggest big band hits, “Undercurrent Blues”. The Forties and Fifties were a prolific and important era in Chico’s career. It was during this period that he composed what is universally regarded by critics and fans throughout the world as the crown jewel of the Afro Cuban Jazz Genre, the extended, multi-movement work, “The Afro Cuban Jazz Suite” recorded with Charlie Parker, Flip Phillips and Buddy Rich. He also wrote countless other works for Machito, Dizzy Gillespie, Stan Kenton, and for many others including his own orchestras. With the advent of rock and roll and the seeming death of the big band in the sixties and seventies, Chico turned his attention to commercial writing, including jingles, film scores and industrials. However, he maintained a creative presence contributing brilliant compositions and arrangements for the likes of Count Basie, Ringo Starr, David Bowie, Gato Barbieri and countless others. He also wrote another important extended multi-movement work for Art Farmer, “The Aztec Suite”, another critically acclaimed masterpiece. In 1995 after 30 years of not recording under his name, O’Farrill came out with the Grammy nominated “Pure Emotion”, soon followed by the also Grammy nominated “Heart of a Legend”, and finally “Carambola”. All of which were hailed by Jazz critics and fans throughout the world as the renaissance of a true American Jazz genius. His memorial in 2001 at the Church of Saint Peters in New York City (the jazz church) was filled to overflowing with lines around the block as musicians and fans celebrated the life and work of this quiet, dignified Cuban gentleman who adopted New York City as his new island home. His music is celebrated to this day, performed by his orchestra, which is in residence at New York’s famed jazz nightclub Birdland and by Jazz at Lincoln Centers’ Afro Latin Jazz Orchestra, both of which are directed by his son, composer, arranger and pianist, Arturo O’Farrill. The Chico O’Farrill Afro Cuban Jazz Orchestra is a direct link to Afro Cuban Jazz’s greatest composer. Every member of this world-class ensemble sat under the beloved Maestro. When Chico O’Farrill passed away in June of 2001 the baton was passed to his son, Arturo.